The Pi Kappa Alpha Fraternity is a Greek letter, secret, college, social fraternity. It is composed of men who share similar ideals of friendship, truth, honor and loyalty. What began in Room 47 West Range at the University of Virginia back in 1868 has now endured for well over a century, growing into one of the largest fraternal organizations in the world. How? The reason is simple. Pi Kappa Alpha has remained dedicated to developing men of integrity, intellect, success and high moral character, and to fostering a truly lifelong fraternal experience. BOTTOM LINE: Pi Kappa Alpha enhances the collegiate experience while providing a lifetime of opportunity and reward. Its legacy demands nothing less than excellence. Pi Kappa Alpha consists of Scholars, Leaders, Athletes and Gentlemen (S.L.A.G.). If you exemplify one or several of these ideals, you could be just the type of person that PIKE is looking for. Pi Kappa Alpha is continuously working hard to find men who want to be champions, men who are dedicated to a common vision. When you graduate college you will have a Diploma, a GPA and a few friends and memories. When you graduate Pike, you will have a network for over 250,000 initiates, lasting ties of friendship and brotherhood, and memories and experiences that you will never forget. Pi Kappa Alpha realizes that students enroll in college, first and foremost, to get a quality education. Consistent with this philosophy, the Fraternity places a strong emphasis on scholarship and on educating our members both inside and outside of the classroom. Through minimum GPA standards, mentor programs, educational programming and Pike University events, members are equipped to excel academically. The Fraternity provides a valuable arena for developing and honing leadership skills that will benefit the individual member throughout his life. In addition, Pi Kappa Alpha promotes leadership through campus involvement, by encouraging its members to take on positions of leadership in other organizations. By being members of one of the largest fraternal organizations in North America, our members are provided the opportunity to not only gain elite leadership experience while in college, but to network with our highly successful alumni in their post-graduate careers. 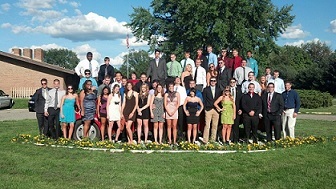 Pike University is North America’s premier fraternal leadership training program. Its objective is to develop and conduct leadership, management, and personal development programs in a manner that prepares its members for success in life. There are 12 or more leadership and educational conferences hosted by Pike University each year. With curriculum rivaling the caliber of any corporate training program, Pike University teaches brothers to be better leaders today – and better and more principled leaders in society in the years ahead. Pi Kappa Alpha believes that athletic competition can provide valuable benefits to college students, because it encourages young men to challenge each other and to perform at their highest levels. Pi Kappa Alpha is dedicated to inspiring its members to compete and push themselves in everything they do. We believe that through athletic competition, we will build teamwork skills fundamental to success in the business world, bolster unity within the chapter, contribute to the physical and mental health of our members, and improve the quality of the overall college experience. Competition breeds excellence – in the classroom, on the playing fields, and in our daily lives. Pi Kappa Alpha is dedicated to developing men of integrity, intellect, and high moral character and to fostering a truly lifelong fraternal experience. Six exemplary gentlemen founded Pi Kappa Alpha in 1868 as a way to build friendships based on common values. Today we continue in their tradition by recruiting quality gentlemen – men that respect themselves, their peers, and their communities, as stated in our True Pike values. Members of the Fraternity are taught proper social skills and etiquette through membership development programs, and given the opportunity to practice these skills at social events such as mixers, exchanges, and formals. In addition to the social aspect of being a gentleman, members are strongly encouraged to participate in the numerous community service and philanthropy opportunities presented by our chapters. Pi Kappa Alpha believes that a commitment to service is a crucial part of developing as a young man.